Among the different names, alongside the very French sounding Severin or Gervais, the name “Patrick” features proudly as a reminder that the Irish Church presence in Paris stretches back at least a millenium and even further. Irish monks came to study and teach in the medieval university. The Irish College was founded in 1578 by six young priests who took refuge in the city after being expelled from Flanders. The Chapelle Saint-Patrick was part of the newly acquired and refurbished Collège des Irlandais on the brow of the Montagne Sainte Genevieve in 1769. Through Revolution and through world wars, there has been a worshipping presence of Irish people in Paris, a community poetically described as one of “soldiers, priests and scholars”. History was made when prayers were offered in Irish for the first time on the Main Altar of Notre Dame at noon on 16 March 2013, it will be a proud moment for that small but vibrant community. 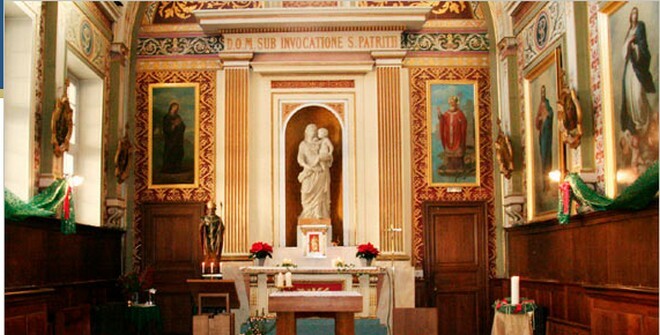 Pilgrims from Ireland will join the Irish people and their friends who worship in St Joseph’s Paris and in the Chapelle Saint-Patrick each Sunday. The Kildare and Leighlin Choir, under Fr Liam Lawton, will fill the 850 year old space of the great Cathedral with Irish liturgical music. Bishop Noel Treanor will represent the Irish Bishops on this occasion and will preside at Mass while Msgr Brendan Byrne, Administrator of Kildare and Leighlin will preach.